Back in November 2018, I had played in Dungeons & Dragons 5th Edition game that was live-streamed to benefit the Extra Life for Kids charity. A. Happy “Hap” Gnome is a silly multi-class (4th Level Rogue, 1st Level Bard) character created for an Extra Life Live Stream charity event during Gamehole Con 2018. The game, which was run by Mike Mearls, included John “JinJur” Kovalic, Lysa “Oooh, I’m an angry fish!” Chen, Pat “Pala-Dad” Kilbane, and Rob “Correllon” Wieland. 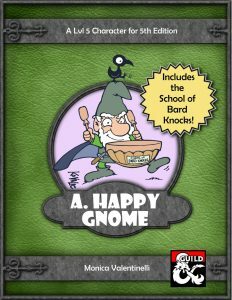 Now, I’m pleased to announce you can download Hap’s character, his sordid backstory, and a new Bard College called the “School of Bard Knocks” on DMsGuild.com. A. Happy Gnome was illustrated by John Kovalic. A portion of the proceeds will automatically be donated to Extra life. Help Me Give Kids an Extra Life! I’ll be a guest at GameHoleCon which takes place Thursday, November 8th through Sunday, November 11th. During the show, I’ll be playing Dungeons & Dragons 5th Edition to raise funds that’ll help sick kids get the healthcare they need! The charity drive is called “Extra Life” and will help cover expensive hospital costs. Since this is the first year I’m participating in the event, I set an initial goal of $250. There’s a list of donation incentive rewards you can choose from, and these will help build and customize my character for the game. If I reach my fundraising goal, I’ll up the limit and sweeten the reward pot! Hope you can help me participate. Every little bit helps! Here’s a link to my Extra Life participant page.